Students are prepared to be skillful, reflective, and expressive readers, writers, speakers, and listeners. The Genesee Community Charter School English and Language Arts (ELA) curriculum follows the New York State Next Generation Learning Standards and typically integrated into learning expeditions where students gain a deep understanding of different topics. Grounded in the New York State Next Generation Learning Standards, our ELA curriculum plays an integral role in our curriculum. ELA is typically integrated into learning expeditions allowing students to gain a deep understanding of the topic they are studying. Reading and writing are ultimately about understanding. In order to gain and show that understanding independently, students need to be able to interpret written language. 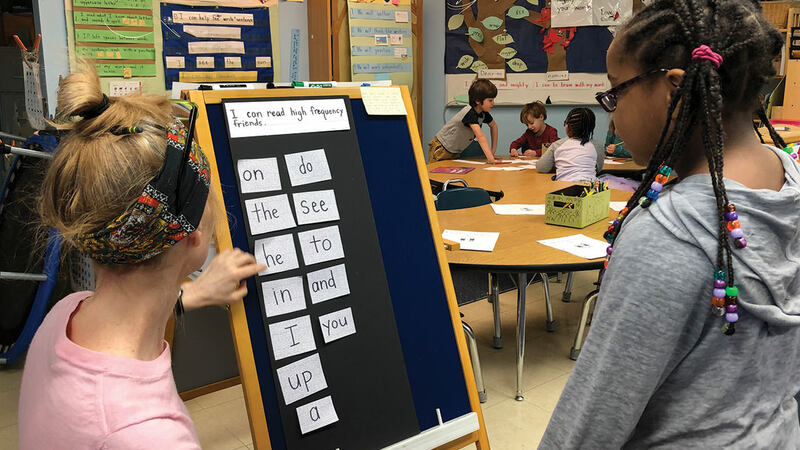 Our primary classrooms use the EL Educations K-2 Reading Foundations Skill Block to teach students the skills needed to acquire strong and automatic knowledge of letters and sounds. In addition to the K-2 Reading Foundations Skill Block, content-based literacy is taught through modules that align with expedition content. The structure of the module allows students to build fluency, practice language standards, and gain a deep schema for rhythm and syntax. Students read, sing, discuss, dramatize, draw, and write to acquire strong content knowledge as well as literacy skills. View videos below to learn more about K-2 Skills Blocks development. ELA is taught through modules that are integrated into the learning expedition. The curriculum engages students through compelling, real-world content. Students learn to navigate complex text through “Close Reading” protocols. These series of lessons invite students to analyze and discuss the text to build understanding. Students read informational texts, learn how to ask and answer questions about the text, and learn to collaborate and converse with one another about the content of the text. Writing is also a major component of the integrated ELA and Expedition block. Students are engaged in a variety of types of writing throughout the year. Spelling and grammar skills are taught, often aligning with the Learning Expedition.